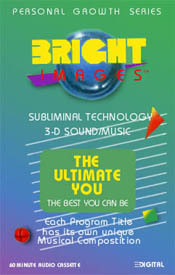 This is the most unique of all Bright Images programs because it will enhance your new self-image as you begin to discover the ultimate you. Explore your hidden talents and with creative thoughts, and become more assertive as your personality really starts to shine. This program will show you and others your most unique qualities as you become close to your ultimate goals. This program creates a feeling from within that you are the best you can be at all times. It helps you feel that you are unique, you have a purpose, you have great potential, you love yourself and your opinions of yourself. Essentially, the program instills a great feeling of confidence in you and your abilities.